UP LT Grade Teacher Recruitment 2018, 2019 Check here UP LT Grade Inter College Teacher Recruitment 2018, UP LT Grade 8400 Bharti Latest News 2018. UP LT Grade Teacher Vacancy 2018 Upcoming Advertisement of LT Bharti Latest News, apply Online with in Months UP LT Grade Teacher Vacancy 2018. UP B.ED LT Grade Lecturer Recruitment 2019: As a Lt Grade Madhyamik Shiksha Parishad is going to add B.ED eligibility in UPCOMING UP Lecturer Recruitment 2018. For this if candidates are B.ED degree holder they can fill any types of Lecturer jobs in Inter College. Upcoming are 8000+ and Bed should be first priority. UPPSC LT Grade Teacher Vacancy 2018 Online Application are invited from 10,768 UP LT Grade Teacher Recruitment in 2018 with other Male female jobs like principal, Lecturer, Computer Teacher and Routine Clerk in all Self Administrated school (in Hindi Ashaskiya Vidyalya). 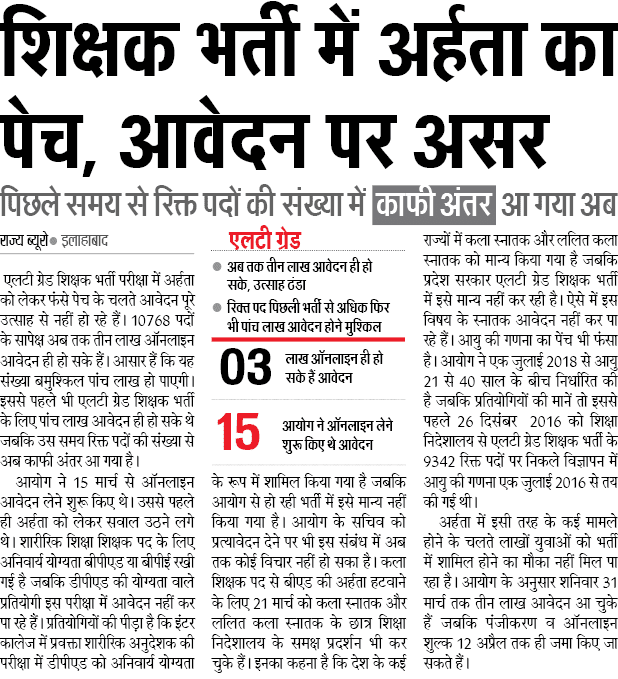 Uttar Pradesh Ashaskiya Inter College School Teacher Jobs from many year huge amounts of posts is vacant and after becoming CM Aditynath Yogi Government which have promised to give govt jobs in Teacher. In 1st Phase UP Police 33,000 Constable and 3200 Sub Inspector Notification given. UP LT Grade 8,400 Recruitment 2018:- Their are 8400 Vacant posts is available in LT Grade Teacher specially in UP Rajkiya Inter College and Highschool. To get more details on how many will be in future under LT Grade try below news. LT Grade Teacher Latest News:- Update of 23 August IF YOU are going to apply in next vacancies of LT Grade teacher related jobs we have good news for you. Uttar Pradesh Lok Sewa Ayog is changing some subject eligibility criteria in Arts, Biology, Computer and Sanskrit. IF Rules of changing qualification of LT Grade than it will not effect current jobs. UP LT Grade Form Opening Date 2018:- Latest News 4 June 2018 Candidates who are background from Computer, Sanskrit, Hindi, Age Limit with overage will able to apply soon from June 2018. 1. LT Grade Shikshak Bharti 2018 will be able to accept 200 candidates from 4 June 2018. 2. Who have apply offline and have name list in Allahabad high court rit will apply online. Note:-Total 7,50,000 + registered candidates to give exam. UP LT Grade Written exam date is 29 July 2018. UP LT Teacher Last date 2018:- to fill application will be extended to June 2018 because of many people who were unable to apply for some subject due to eligibility criteria they were now can fill UP LT Grade Teacher Last. UP LT Grade Teacher Latest News 2018:- Due to Eligibility criteria of 10768 LT Grade Teacher Recruitment only 3 Lakh candidates have applied as compare to 9342 Teacher in which 5 Lakh candidates. Merely 5 Lakh candidates make registration during last date of LT Grade. Check below latest news 2 April 2018. UP LT Grade Computer Teacher Eligibility Criteria 2018:- Latest News 21 March Many candidates visited office of Apar Shiksha Nideshak Officer and given protest letter to Manju Singh Senior Nideshak to add eligibility criteria of PGDCA in LT grade and also wanted to remove B.ED. UP LT Teacher Recruitment 2018: Apply Online from 15 March to fill10,768 UP LT Grade teacher exam calendar will be declared on official website o UPPSC who is now ready to conduct written exam for LT grade vacancy in UP. UPPSC has made the syllabus of LT and after approval by commission written exam date published online. UPPSC LT Grade Teacher Vacancy 2018: In a Latest Statement given by LT Grade teacher board that UPPSC will preparing the board which is responsible for Result, Syllabus Makinf and Giving appointment letter. Age Limit of LT Grade Teacher:- Minimum Age of candidates who have appliegive relaxation on age limit who applied 20 year to Maximum 40 years. Relaxation as per government rules and follow the given steps for LT Grade Teacher Jobs. UP 10,768 LT Grade Vacancy 2018: UPPSC now started making criteria of 10,609 10768 LT grade teacher vacancy. In this posts UPPSC is making syllabus of it. It is estimated more than 5 Lakh applicant will apply for LT grade vacancy in UP and college will get 10,000+ employee. Department Name: Uttar Pradesh Secondary Education Service Selection Board. Posting: Government Inter Aided College, Ashaskiya Vidyalaya and Self Administrated College, Rajkiya Madhyamik Vidhyalaya, GIC and GGIC. Total Number of Vacancies: 10,768 Posts of Licentiate Teacher Male and Female. Selection Process: In 20765 Vacancy of LT Teacher Recruitment candidates should have to qualify written qualify and LT Merit List with Male, Female cut off marks mandal wise bharti. UP LT Grade Teacher Syllabus 2018 from Next year is applicable we soon update. Educational qualification: Graduation, Bed degree to apply for this UP LT Teacher recruitment med degree holder. Age Limit: Minimum Age starting from 20 year and Maximum 40 years. Relaxation as per government rules www.upsessb.org and follow the given steps for LT Grade Teacher Jobs. The last date of applying for this UP LT Grade Teacher Principal recruitment: 16 April 2018. UP LT Grade Teacher Merit List 2018: Total LT Grade Teacher Vacancy Merit list is waited by approve 5 Lakh candidates as well as many are waiting for re apply because of server issue occur in last date lt grade teacher vacancy in UP.LT Grade District Wise Recruitment 2017: Agra, Aligarh, Allahabad, Azamgarh, Bareilly Moradabad, Saharanpur, Basti, Chitrakoot, Gonda Devipatan, Faizabad, Gorakhpur, Jhansi and Varanasi. Uttar Pradesh Secondary Education Service Selection Board will conduct written exam, merit list and other eligibility criteria to get job of LT Grade Teacher Bharti 2017. Latest News 21 March 2018 UP LT Grade Teacher Vacancy 2018: UPPSC will takes application of LT Grade, Conduct written exam in upcoming month. In recent period many education, UPSSSC Board etc changed now all types exam and interview conducted through new committee approval. UP LT Grade Teacher Bharti 2018: UP LT Grade Board will going to conduct written exam and cancelled the previous of Interview and merit list UP LT Grade Teacher.Many applicant said they are not getting relaxation under merit list. 700 Lecturer LT Grade Vacancy Latest News: On 12 October 700 LT Grade Teacher and Lecturer of 2009 to 2013 will get appointment letter who have got jobs but not get Niyukti Patra. If in these 700 candidates unable to get jobs in home district will get placed in other district. UP LT 9857 Teacher Vacancy 2018: Latest Update Madhyamik Shiksha Parishad will fill 9857 LT Grade Teacher + 400 vacant posts more added due to retirement of Teachers. Previous Posts was 9342. On 20th September High Court has stopped (cancelled) to recruit 9342 LT Grade under Deputation and Retired employee who currently worked in education department. High Court further said give us further statement on why UP government has changed the Decision. Note: After transfer of Head Assistant of LT Teacher 28 February, 21st March, 25th March, 6 April and 27th May candidates document regarding merit list, counselling process, selection list not found. UPPSC LT Grade Admit Card 2018:- Written exam latest news of LT grade teacher may be transfer or cancel to next date of 29 July which is reserved date to conduct test. 1. 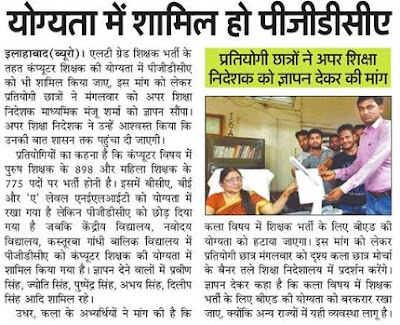 Responsibility of LT grade exam is given to UPPSC. 3. 8 Subject from posts of 9294 vacancies is suspended.